At his peak, Al Capone was America's most powerful mobster, overseeing a massive Chicago crime syndicate during Prohibition's heyday. So what would finally take down this kingpin? The betrayal of a loyal associate maybe? A brutal mob murder? Please. This isn't the movies. The Godfather's tendency to not pay his taxes would prove his downfall. Unable to nail Capone on racketeering charges, authorities found him guilty of tax evasion and sentenced him to an 11-year prison term. 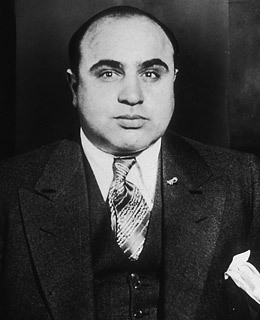 By the time he was released, Prohibition was kaput, and other mobsters had taken over his organization. See how to file a tax extension.